Heralded as a geological marvel, this beach—located in the Islas Marietas National Park in the Riviera Nayarit—is the only beach in Mexico to make the list and the first to appear in the article. National Geographic recently published its list of the “Top 21 Beaches in the World” and the Riviera Nayarit’s Playa del Amor—also known as Playa Escondida, or Hidden Beach in the Islas Marietas—was not only chosen for the article but topped the list, which was written by Kimberley Lovato. The article was published on the US website which has more than 26,212, 694 unique monthly visits. It was also published by Nat Geo and Australia’s Herald Sun, the UK’s Daily Mail and Mirror, and in Pop Sugar in the US. The beaches were chosen for being enviable stretches of sand, others for their excellent surf waves and others, such as the one located in the Riviera Nayarit, for being extraordinary natural phenomena. 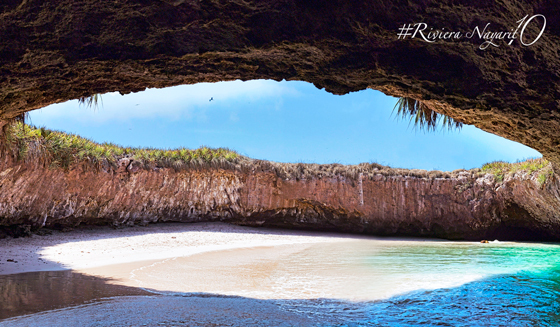 Titled a “Geological Marvel” for the ring of stone that encircles it above and allows the sun to shine in, it’s the only beach in Mexico that made the list of this prestigious international medium, which specializes in the environment, science and history. It’s important to point out the Islas Marietas National Park has many other attractions with their own natural beauty. The area is also a Protected Natural Area, and there are adequate restrictions in place and can only be visited via certified operators and by following the rules and regulations at all times. To best appreciate nature it’s important to respect it and preserve it in the best way possible, which is why there are efforts currently underway by several segments in order to preserve the natural heritage of the Riviera Nayarit. To read the article please click here: Top 21 Best Beaches in the World.